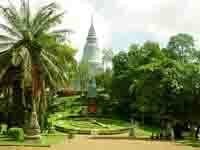 Wat Phnom ("Temple of the Mountains" or "Mountain Pagoda") is a Buddhist (Wat) located in Phnom Penh Cambodia. It was built in 1373, and stands 27 metres above the ground. It is the tallest religious structure in the city. The sanctuary itself has frequently been rebuilt several times in the 19th century and in 1926. The interior has a central altar complex with a large bronze seated Buddha surrounded by other statues, flowers, candles and items of devotion and worship. The walls are covered with murals, especially of Jataka stories of the Buddha's earlier reincarnations before his enligtenment. There are also murals depicting stories from the Reamker, the Khmer version of the Ramayna. The newer murals in the bottom tiers are somewhat balanced, traditional and modern.